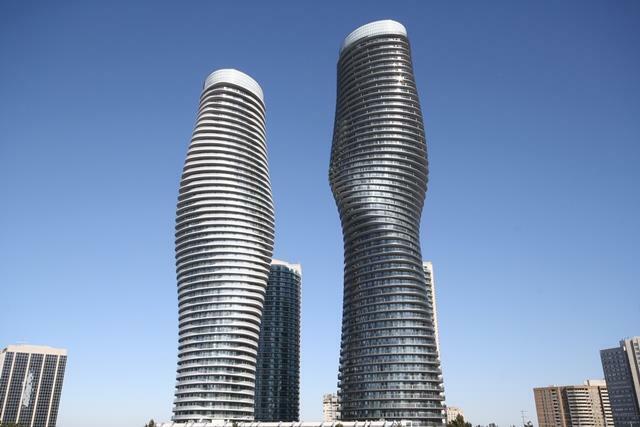 Absolute World Towers are located at 50 and 60 Absolute Ave in Mississauga. Absolute World Tower 1 unofficial name is Marilyn Monroe because its shape resemble beautiful curvy body of the famous actress. The lower of two towers Absolute World Tower 2 unofficial name is Monroe Mate. 50 and 60 Absolute condominiums offer breathtaking view of Mississauga and Toronto skyline. Absolute World is Mississauga’s premier spot directly locateed across from Square One, steps to Mississauga transit, Go Transit and quick access to major highways. Absolute World Towers are part of Absolute complex which includes 70,80 and 90 Absolute. Absolute World Towers are iconic residence soaring above the Mississauga skyline. Absolute condominiums are internationally acclaimed winner of world wide architectural competition. These condominiums have unique elliptical glass exterior with expansive wrap around balconies. These condominiums offer world class features and finishes. All parking with security alarm stations and security monitoring from manned gatehouse. suite intrusion alarm system with personal key pad and door contact at all suite entries. Emergency in-suite voice communication system, smoke and heat detectors. Live surveillance cameras monitored by concierge and manned gatehouse.